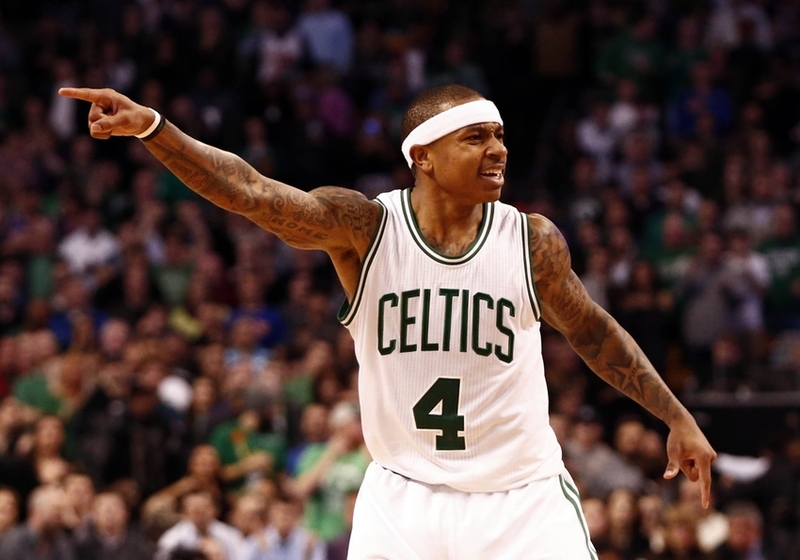 With Isaiah Thomas back at the helm, the Boston Celtics have put together a four-game winning streak that included a 17-point comeback at Memphis. Thomas scored a career-high 44 points in the overtime victory against the Grizzlies, and the Celtics will face a huge test tonight against Oklahoma City. Boston next heads into Madison Square on Christmas, and the Green hopes to have a better result than they did exactly five years ago in the same building. In the lockout-shortened 2011-12 season, the NBA began regular season play on Christmas Day with the New York Knicks hosting the Celtics, and Carmelo Anthony’s game-high 37 points led the Knickerbockers to a 106-104 victory in the back-and-forth contest. Anthony along with Avery Bradley, who played fewer than 10 minutes on December 25, 2011, are the only Knicks and Celtics players currently on the same roster as they were for the first game of the 2011-12 season. Bradley, who could be joining Anthony on the Eastern Conference All-Star team in February, will be making his first career Christmas Day start on Sunday. The 26-year-old guard out of Texas is looking to make more of an imprint this time around in New York – his box score on Christmas Day in 2011 comprised of just two missed field goals and a turnover. However, five years later, Bradley has registered nine double-doubles in just 28 games, after just two combined double-doubles in his previous six NBA seasons. Through about 40 percent of the 2016-17 regular season, Bradley is enjoying a career year, and looks to showcase it on national television Sunday. He is scoring, shooting and rebounding at the best rates of his career. Although his field goal percentage is not as strong as his career-best in 2011-12, his effective field goal and true shooting percentages are his NBA bests. In addition, Bradley is arguably the team’s best rebounder after being Boston’s worst last season. His 4.6 rebounding percentage was dead last on the 2015-16 squad. However, the only Celtic who has played at least 10 games this season and has a better rebounding percentage than Bradley is Tyler Zeller, who has not even played one-third of Bradley’s minutes this season. In addition, Bradley is the first of two Celtics guards who have played 20 games and are in the top 10 in rebounding percentage among guards this season. With Bradley’s 11.6 and Terry Rozier’s 9.6 rebounding percentages, the Celtics are the only team with multiple guards in the top 10 in that category for their position. They are both on pace to outperform Evan Turner’s 9.4 rebounding percentage in 2015-16, which led Boston guards who played at least 40 games last season. Although the Celtics have two of the best rebounding guards in the league, they cannot say the same for their team rebounding. While Al Horford has been a significant addition to the squad, the only time in his career that he was a part of a top 15 rebounding team was his rookie season in Atlanta. The Celtics will have a tough test against the Knicks, who are in the top six in offensive rebounding this season. On the bright side for Celtics fans, New York cannot boast about its 29th-ranked defensive rebounding, which is even worse than the Celtics’ 28th-ranked defensive rebounding. The green will look to duplicate its strong rebounding performance from its November 11 matchup against the Knicks at TD Garden. The Celtics grabbed season highs in offensive rebounds (19) and total rebounds (53) en route to their largest home victory of the season. The high number of total rebounds was due in part to Carmelo being ejected for receiving two early technical fouls in the contest. While the Knicks were missing more shots without him, he is by no means a special rebounder. The Celtics frontcourt battled the likes of Joakim Noah, Willy Hernangomez, Kristaps Porzingis to grab those 19 offensive rebounds, but Boston also allowed a season-worst 21 offensive rebounds to New York. The Knicks also outrebounded the Celtics by four in the contest. On Christmas Day, the Celtics will likely not be lucky enough to see another Carmelo ejection, and with how he is shooting recently, the Celtics need to continue playing their strong defense. Anthony and the Knicks returned home on Tuesday and made a comeback of their own against the Indiana Pacers to end New York’s three-game losing streak. Anthony scored a game-high 35 points and made a season-high seven 3-pointers in the win. Derrick Rose was out for each of the Knicks’ losses in Oakland and Denver, but his 24 points were instrumental in the 15-point comeback against the Pacers at MSG. The Knicks and their fans will be looking for more scoring from Rose on Sunday; as a member of the Bulls, he was 9-1 against the Celtics in the regular season and playoffs when scoring more than 20 points. On the other hand, Boston will look for strong shooting from Thomas and Horford. When the last pick in the 2011 draft shoots at least 50 percent from 3-point land, the Celtics are 8-0 this season. In addition, when the former Atlanta Hawk shoots better than 50 percent from the field, Boston is 6-1, and when he is better than 50 percent from 3-point distance, the team is 4-0. The Celtics and Knicks both have improved their shooting from last season, and they are winning when having a better effective field goal percentage than their opponent. When doing so this season, Boston is 14-2, and New York is 14-0. Shooting seems to like it will be the key when Christmas Day kicks off at Madison Square Garden. Statistics and information are through games on December 20. For more sports coverage, follow Adam Lowenstein on Twitter at @StatsAdam. Statistics used from ESPN.com, NBA.com, TeamRankings.com and Basketball-Reference.com.